I purchased a second set of these bags. They seem to be keeping my fresh root vegetables from spoiling too quickly. I am so tired of throwing away what were perfectly good onions and potatoes. Now they last longer and the product is so well made you don't mind keeping them on display. This would make a great gift for friends and family that cook a lot. They are very good looking. 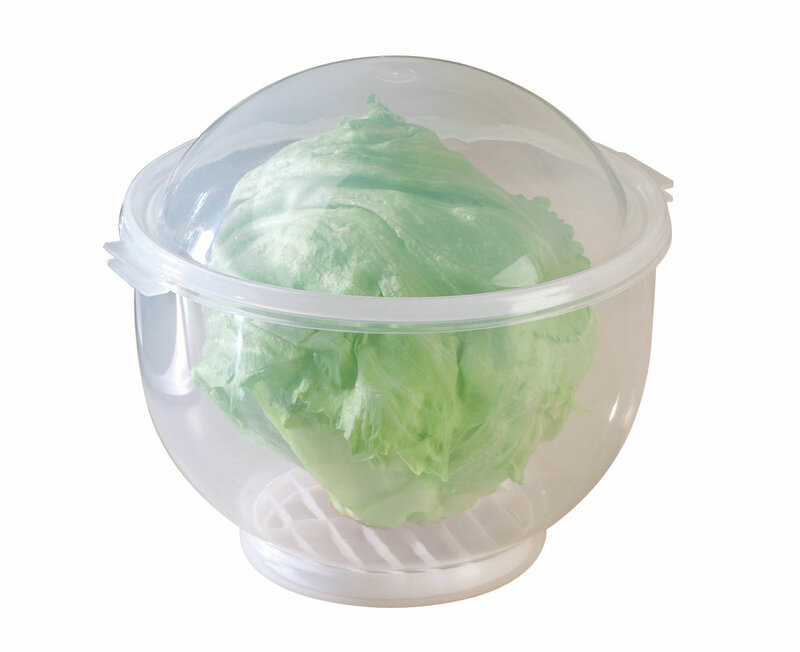 This is the best thing that I have found to keep potatoes and onions. Mine always used to go bad before I could use them up. Not any more. Great Product!!! these work great! I wanted to store my potatoes and onions in a small space. No more plain bags or onion peels on the floor. Keeps things neat,looks nice, and no sprouting. These are the coolest bags. 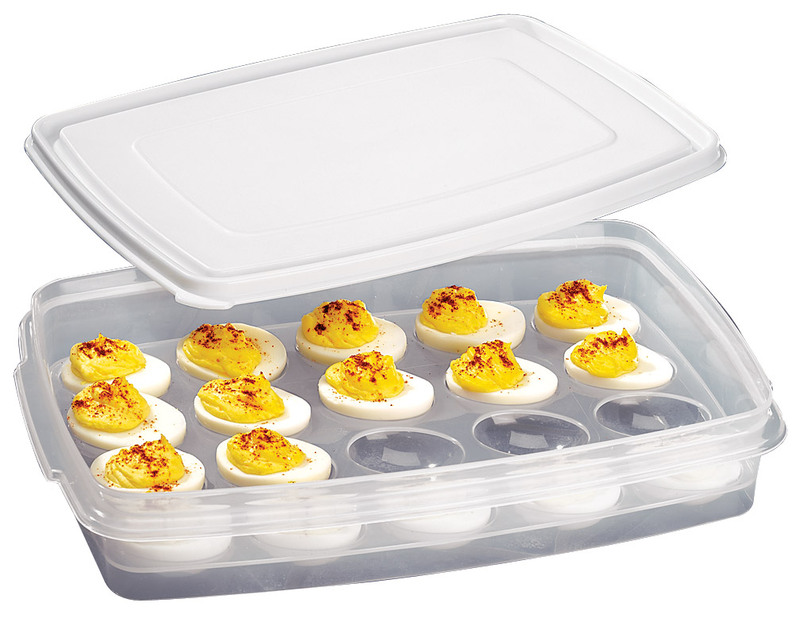 Not only do they store your items and keeps them fresher, by using them you no longer have the dirt from the potatoes and the skins from the onions all over your pantry floor. I bought these for myself and loved how they looked in my kitchen instead of having the bags that the potatos and or onions came in so I ordered more and gifted them to friends. A positive buy! I don't have a lot of space in my kitchen, so these bags can hang in my pantry out of the way. They do delay the decay of both the onions and potatoes. I have neglected to check them and they have soiled the bags, but they wash up very nicely. I have had a set of bags like these for about 10 yrs now Going to buy a set for my daughter. I swear by these bags. Yes the bags doesn't seem to shut completely but I have had no problems with the potatoes and onions. I just fold the tops over a little so it's like closed. They last a lot longer. Just take them out by the zipper side. Don't put the onion bag next to the potato bag I always believed in that. Looking for a way to keep potatoes & onions without spoiling. Bingo, these bags work. I have never been able to keep potatoes and onions in my kitchen. These bags work well and keep both of them fresh. I'm glad I bought them. this makes my life so easy. I am not throwing potatoes away. It works well in my pantry where the washer and dryer are and keeps out the heat so my onions and potatoes don't sprout. I liked it so well, I bought a pair for my dtr in law who had trouble storing her onions etc. It is much nicer looking than just having the onions and potatoes out in the open in a bin.They keep out the dirt and onion peels that fly around when they are just sitting out. I love this product! First, I bought it for myself. It was so great that I just bought it for my daughter. Vegetables last so much longer and the bags are easy to store. I was going crazy with onions and potatoes sprouting before I had a chance to use them, even though I thought I was storing them correctly. I didn't expect this to work since it was such a reasonable price, but it really does!! Just love it!! I have seen these bags many times in your catalog, but never ordered them because I figured for the price, they couldn't be much. I could not have been more wrong. They are very well constructed. The quality is unbelieveable. Now my veggies have a nice, new, clean home. I am so glad I ordered them!! We dig our own potatoes and needed some kind of bag to store them, couldn't find quite the right thing. This fits the bill, and the zipper makes it so easy to grab the oldest potatoes. The Vegetable sacks were better than I thought. They are not made of flimsy material and hold a lot. I actually got 5 lbs of potatoes in the the potato bag with some room to spare for closing. I also love you load it from the top and draw string it shut; hang it up (I have coat hooks on the inside of a closet); and unzip the bag at the bottom to remove the potatoes. I bought the product because it is useful around the house. Great bags, we do not have a lot of room in our kitchen so these bags that can hang in our small pantry are perfect. I have these onion and potato bags hanging from peg racks near my kitchen ceiling. 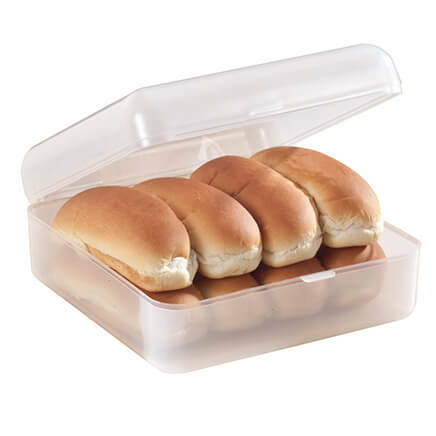 They're really handy "reach and grab" storage devices, just in the food preparation area. These really do keep the potatoes and onions fresher longer. These bags really work. I have been storing my onions and potatoes in plastic bags and they did not last long at all. 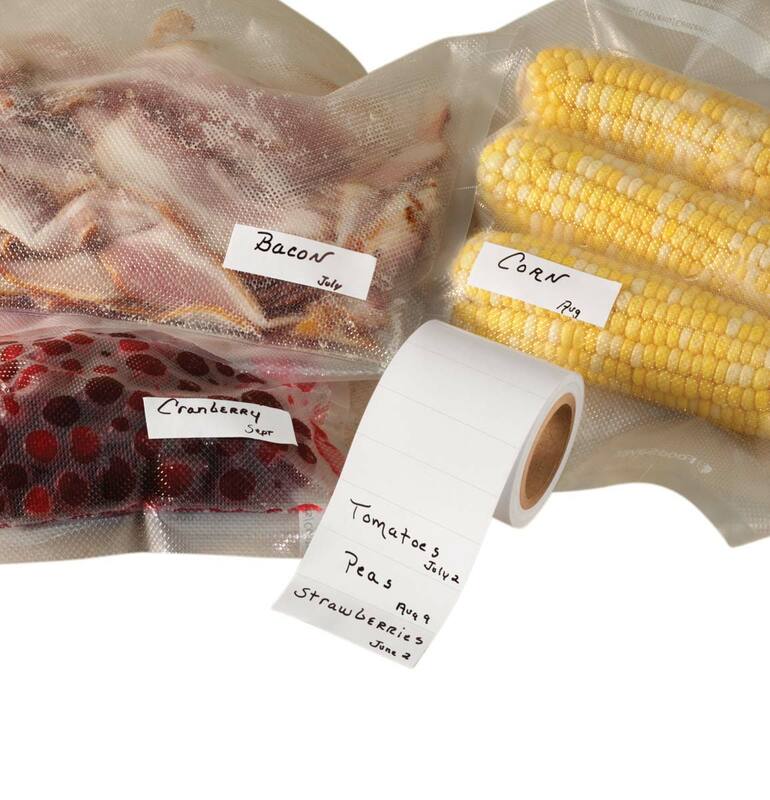 These bags really do extend the life of your produce and give you a neat, handy place to store them. The only problem I have with them is that it is hard to get the bag closed with the drawstring. I never got mine completely closed. I just use the zipper feature so I never need to open the drawstring. I was tired of having to throw away potatoes and onions that had sprouted before I was able to use them. These bags have saved me money and vegetables last a longer period of time compared to other storage options. Thank you for offering these bags in your catalog. When I first purchased this item, I was very skeptical about this product. BUT after receiving it and using them, I have definitely changed my mine. Recently the potatoes that I have been purchasing are wet/damp and would start to develop mold or even go bad quickly. I let the potatoes set out for at least a day after getting home and then I put them in the bag. They stay dry, do not mold and do not start growing eyes as quick as before. Have not used the onion bag as space in the pantry is limited. Thus far, I am very happy with the item, but have only been using it for about 10 days. I hate to waste money on vegetables. 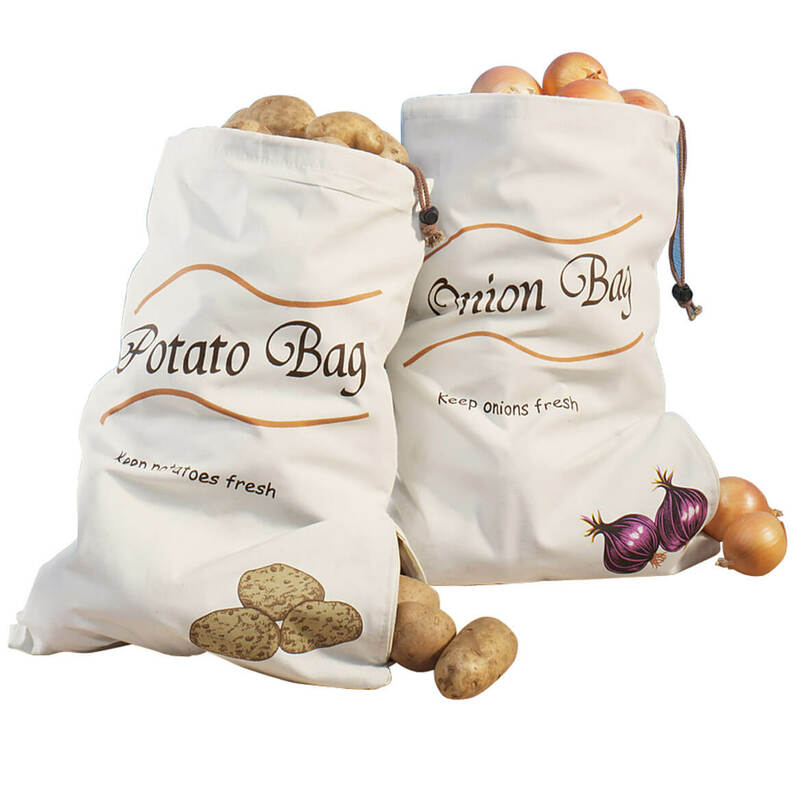 These bags keep onions and potatoes from sprouting. Excellent value. I bought this mainly for my mom because she buys a lot of potatoes and onions and this worked out perfectly for her. I bought the first set of bags for myself and use them all the time. Keeps onions and potatoes very well. My daughter and daughter-inlaw saw mine and really like them so I bought a set for each. items are not sprouting, because of black liner. Storing potatos and onions. Only time will tell if it works. The drawstring closure is very stiff. It didn't close tight. Will that matter? We will see. Just the right sized for each vegie. So far I am very pleased with this product. Keeps the onion skin mess contained and the potatoes seem to be lasting in the darker containment. Nice bags, but the drawstring is extremely hard to close. Not sure yet if they work for the intended use. I went to get potatoes a few hours ago. I had this bag and another brand. I purchased a 5 pound bag of Russet potatoes a week ago. The other bag was quite a bit smaller and only held six potatoes which all were wrinkled and starting to go soft. The whole rest of the bag fit into this bag. Imagine my surprise when I discovered them to be as fresh as the day that I bought them! So far so good with the onion bag as well. I just ordered another bag because I tend to buy a lot of onions and potatoes during the winter months and I like to buy different varieties. The only drawback is that they are a bit on the small side. At least for me. Ordered these bags for myself and love them so I ordered a set for my sister and what I received was 2 five lb bags. I contacted customer service and they shipped another set and these were also five lb bags. I have 10 lbs so I knew these two were not what I expected. Didn't contact customer service again. Did not want another 5lb set. So disappointed. I have not had the chance to use the product yet. The order was handled quickly and delivered within a reasonable time frame. The price was also quite reasonable. I would definitely recommend Walter Drake Company to friends. My onion bag came without a draw string. Until I find a string of my own to use/work, my bag is useless as it allows light into the bag. I really didn't see that much of a "saving" difference using the bags versus just keeping them on a dark shelf. 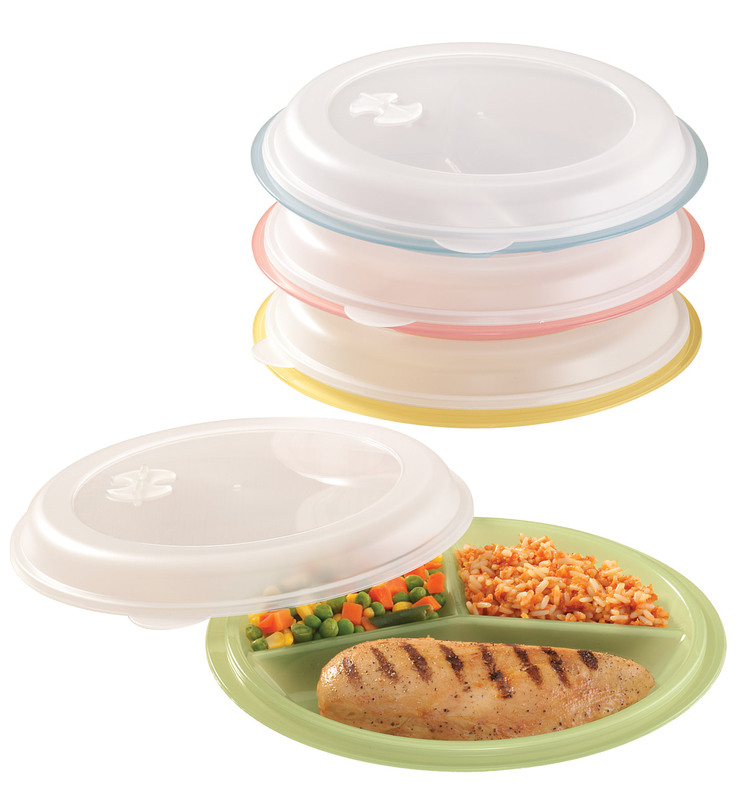 They do look nice, though, and keep the veggies in once contained space. The idea of this bag is great. What I found out though is that timing is very important. I bought two 5 lb of potatoes. I put the potatoes from one bag in the potato bag. I started using the potatoes from the other bag. When I used up this bag I then went to get some potatoes from the potato bag. What I found was the bag was absorbing too much moisture so that the potatoes were shrinking with wrinkling skins. The good news was that they definitely were not growing. What I learned from this is that you have to start using the potatoes right away before too much moisture absorption goes too far and starts killing the potato. I wanted to love these bags, but I just couldn't. I used them for over a year but was never satisfied with the organizational aspect - still just a bag of potatoes on the floor. I would have liked some shape to the bag so that it would "stand" on its own. I also didn't feel that it really extended the life of my potatoes or onions. I just threw the potato bag in the trash after having found rotten potatoes again. Maybe if my family used more potatoes it would have worked better. Frustrating. This bag wouldn't hold a 5-lb bag of potatoes; it's smaller than you think. It's actually a little hard to get to the potatoes inside either from the top or from the short zipper in bottom. I put my home-grown potatoes in it, put it in a drawer, and later found them all sprouted and grown together. The onion bag works better than the potato bag. I went out of town for a week while the bags were filled. Came back to find my onions still good, but the potatoes all had sprouts on them and were soft. Although I have to say that I used them anyway and not one of them was brown inside, which is unusual. They did not go rotten or bad which is a plus. But you can't leave your potatoes in the bags too long. Not sure I would recommend the potato bag, just the onion bag. This is a new item for me. A friend swears by them. Living alone, it takes me two weeks or more to use a bag of potatoes or onions. I hope they work as well for me as they do for my friend! Really good reviews. I have no dark place available for potatoes in my kitchen, so thinking these will look cute out. I'm tired of my potatoes and onions sprouting before I can use them all! Thought I'd give these a try. Hope to stop potatoes from sprouting "eyes" and onions from growing stems. A friend bought them & they seem to work ! Hopefully it will keep potatoes from growing "eyes". 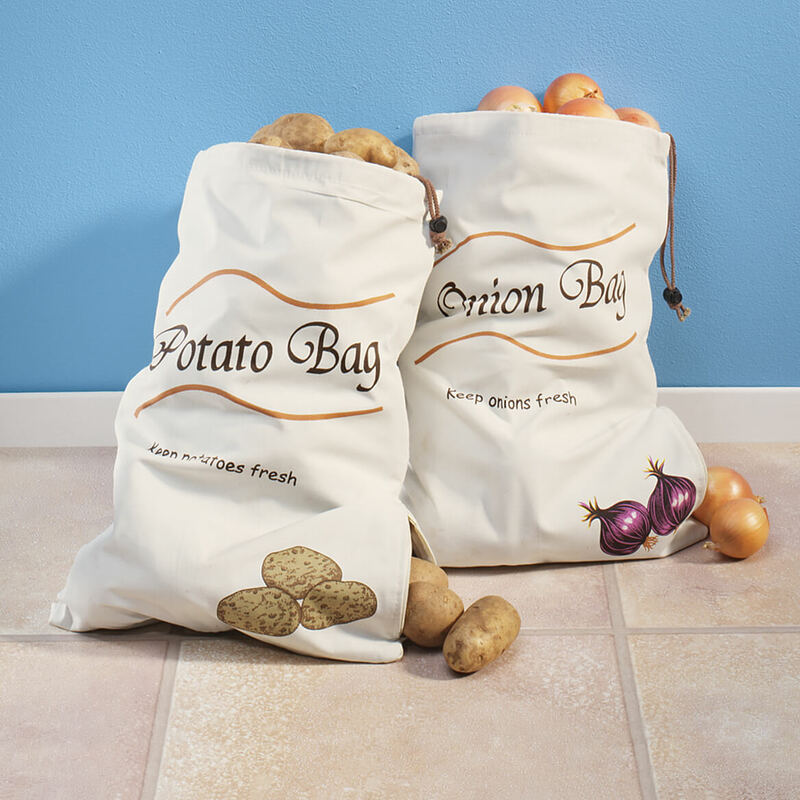 The bags help onions and potatoes last longer. Happy with them. THOUGHT THEY WOULD KEEP VEGETABLES BETTER. I am tired of my onions and potatoes sprouting. I hope this will eliminate the problem. A nicer bag instead of plastic they usually come into. Love the bags. Keeps food from spoiling quickly. I have to keep my potatoes and onions in a closet on the floor and these will work just great. Love them. I buy large bag of sweet onions at Costco. These help keep them fresh until I can use them all. In need of something to prevent my produce from sprouting. Had one before, works great! Have purchased these from you before. They do preserve the potatoes and onions longer. Just be sure that the bags are not anywhere near each other. Onions and potatoes should never be stored that way. Live in part of country (Southwest) where it gets HOT and vegetables sprout quickly if not refrigerated. Needed something to store my vegetables in because I keep losing my vegetables. great price for two bags and I like the zippered side. Tired of tossing potatoes, really hope this works. Need something to keep them fresh!! BEST protection for Onions and Potatoes. Keeps them fresh for a longer time! Can the bags we laundered? Machine washable? BEST ANSWER: Thank you for your question. These bangs should be hand washed in cold water and hung to dry. We hope this information will be of help to you. BEST ANSWER: Thank you for your question. The sprout-free vegetable bags are 14 3/4" long by 10 1/2" wide. We hope this information will be of help to you. Can these bags be used in the refridgerator? BEST ANSWER: I bought both the onion and potato bags. I do not have mine in the refrigerator but they could probably be put in there. Since neither potatoes or onions should be refrigerated, I am going to say no. They work very well. the bags are to big to use in a family fridge. I keep mine in the bottom of my pantry.